My eyes were glued to the article “Rethinking Teaching: Research about how people learn has change the way Oberlin professors teach.” One of the professors highlighted, StephenVolk, won U.S. Professor of the Year Award in 2011 and founded the Center for Teaching Innovation and Excellence. As soon as I was done reading, I emailed Stephen Volk (SV below) and to my surprise and joy, he quickly responded to my interview request! Beforehand I checked out his sample syllabus for History 110. The statements below are reconstructed from my notes and memory, so are not direct quotes. I’m an unreliable narrator, but hopefully you’ll get the point. MF: Congratulations on a great article, and on your Professor of the Year Award! I wanted to know some more details about your blended learning methods alluded to in the article. First of all, it mentions “research on how people learn” that impacted how you teach. What were you reading that brought you to this point? Can you share the names of the specific theories or researchers? SV: First of all, I wouldn’t call it blended learning. It’s a flipped classroom, where the direct instruction happens outside of the classroom so that when students are together in class they can use that time more productively. So I was reading over and over again that we know that lectures are not very effective. Finally I decided, “Well, I better do something about this.” I was reading John Dewey’s articles on social constructivism, some cognitive psychology, and neuroscience about transferring knowledge. Other names to look up are Vyigotsky and Piaget. Basically, the literature says that the social context is where learning takes place. MF: The article mentions that you “prepare 30- to 40-minute video lectures that students view outside of the classroom.” I imagine you can’t do this for all your classes, but just the ones you teach often, like the introductory level classes. MF: How do you create your videos? SV: First I start with my lecture notes to create slides, then narrate over the slides. Oberlin College offers some education technology support but they have to serve all the faculty, so can’t focus in-depth on just one. It takes about 8 hours to make a 30 minute video. I love to tinker, and I need editing software to do that, in case later I want to go back and change the audio or a slide I can. For audio I use Audacity and iMovie for video. Then I post the video to Vimeo. MF: What learner management system or course management system do you use? SV: Oberlin has Blackboard and I post an online syllabus with embedded links to the Vimeo videos and articles on eReserves. MF: How do you know if students are actually watching the videos? SV: Some folks start class with a short quiz, but I don’t necessarily agree with that. Vimeo gives good stats on usage so I might say, “Hey there were only 30 views over the weekend.” But then sometimes students respond, “We watched the videos in a group!” And I encourage them to do that at the beginning of the course. The articles are password protected. MF: How do you manage interpersonal relationships within groups in the classroom? I ask because I’ve seen some negative responses to changes, for example a local medical school changed their curriculum to focus on small, student-led learning groups. These are graduate level medical students, but still pettiness and power struggles can make it a very negative experience. SV: I haven’t really thought about that or had problems with it. However, for the medical school setting I would recommend you look up Eric Mazur at Harvard who has done some work on using small groups in the science setting. You might have folks evaluate a concept in fours. MF: How many students are in your class? SV: Right now there are 49 students in that class-48 have laptops that they bring with them. In the class I divide them into groups and give specific topics or questions for discussion. Each group has a Google doc where they summarize their discussion. Then I can read it or maybe we go back and talk about it as a large group. MF: How do you select groups? MF: Do you have any recommendations for folks teaching outside of a college or university setting? For example, I work mostly with programs at community centers, shelters, drop-in centers, places with higher transition and less of a constant student body. 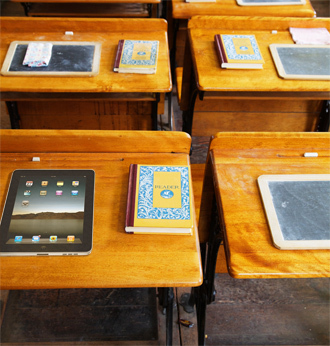 SV: The first thing to think about is that the students must have access to the technology. Maybe instead of full lectures you would use short videos, or DVDs. You have to reduce barriers in order to reduce frustration, otherwise they won’t learn. MF: Thank you so much for your time! This has been really fruitful for me. SV: No problem. Have a great day! This interview gave me a lot of concrete resources, and introduced me to The Flipped Classroom as way to deliver training and literacy instruction to best utilize the “social time” we have together. What lessons about The Flipped Classroom could be useful for you?